tradition + performance | Bartok design Co. tradition + performance – Bartok design Co.
the hinoki bathtub is basically like a large basinet which sits on the floor. The faucet is usually wall mounted or ledge mounted so no adaption is needed. The drain is in most cases not connected with any fitting: the water just flows on the floor towards a floor drain. 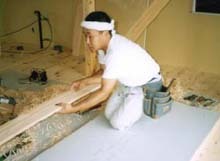 Installation of an hinoki bath is simple and straightforward. We usually have a couple of standard tubs in stock, but we recommend you to have your bath-tub made to order to your specifications. We will be able to customize the tub, match your desired dimensions, choose your preferred wood essence at no extra cost. We will provide you with detailed CAD drawigs and personalized installation instructions. We also provide technical assistance, and a 1-year guarantee against manufacture defects.